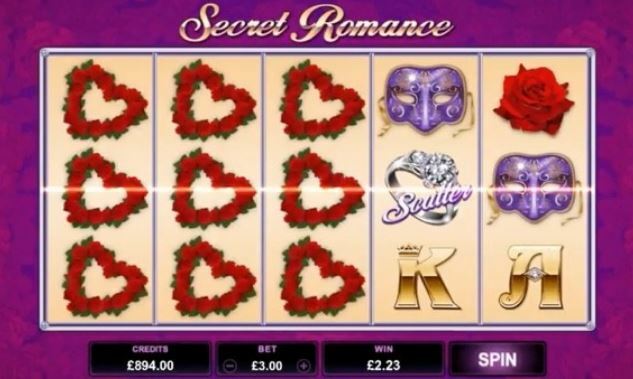 Secret Romance Online Slot is a 5 reel, 15 payline video slot game powered by Microgaming. It had mystery symbols, Free Spins and Scatter pays. The mystery symbols (envelopes) appear stacked in the base game and super stacked during the free spins feature. These envelopes collectively transform into a random symbols, which allows for massive wins across multiple lines. The Mystery Symbols can reveal Scatters – if they reveal 3 or more Scatters they will activate the Free Spins feature. When you line up 3 or more Scatters (the diamond ring), and you’ll trigger the Free Spins feature. During the Free Spins feature, 3 or more of these Scatters appearing will increase the Multiplier Trail – each time 3 or more Scatters land, the Free Spins win Multiplier will be increased one level (the Multiplier Trail can award a Multiplier of up to 5x). You will be awarded 14 Free Spins with Super Stacked Mystery Symbols – these symbols are stacked up to 20 symbols high.